Angelina's Jolie's directorial debut has seen a lot of friction recently due to its rumored subject matter. Thanks to Hungarian Newspaper Vasarnapihirek we’ve now got our first look at the film. An image has surfaced in addition to some more information about Jolie’s story of a Serbian man and a Bosnian woman in love who get separated during the 1992-1995 Bosnian War during which 100,000 people were killed. The image featuring stars Zana Majonovic and Goran Kostic. In an interview with the paper Jolie reveals she’s thinking about releasing the film in black and white. "It’s shot in color but it could transfer to black and white. We haven’t decided that. I can show you… we put a series of pictures together in black and white and it was beautiful. But the important thing I want to make sure that we make a film for people who just want to go to the movies to watch a love story. To not be put off by anything that seems too heavy So we want to walk that fine line to make it accessible to everybody because it’s important for as many people to see it." 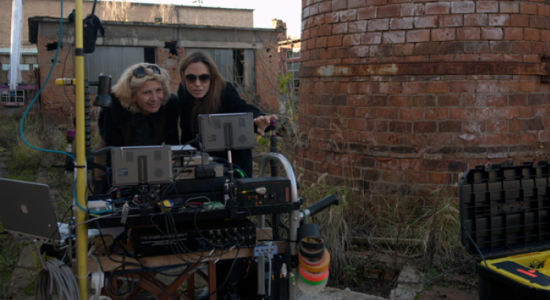 Also, Jolie chose to shoot the movie in two languages. "We actually shot a full version in their native language and we shot a full version in English. We shot two complete films. I was only able to do it because the actors were so fluent in English so they were willing to work hard and do the scenes in two languages." I'm reading: FIRST IMAGE FROM ANGELINA JOLIE'S DIRECTORIAL DEBUTTweet this!